Most of the islands' native population (90–95%)  died from European diseases carried by the Spaniards or married non-Chamorro settlers under Spanish rule. New settlers, primarily from the Philippines and the Caroline Islands, were brought[ by whom?] to repopulate the islands. The Chamorro population gradually recovered, and Chamorro, Filipino, and Refaluwasch languages and other ethnic differences remain in the Marianas. 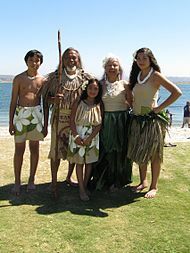 During the 17th century, Spanish colonists forcibly moved the Chamorros to Guam, to encourage assimilation and conversion to Roman Catholicism. 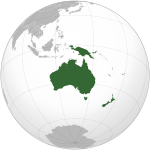 By the time they were allowed to return to the Northern Marianas, many Carolinians from present-day eastern Yap State and western Chuuk State had settled in the Marianas. [ citation needed] Both languages, as well as English, are now official in the commonwealth. 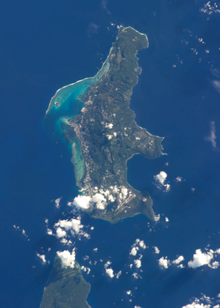 On June 15, 1944, near the end of World War II, the United States military invaded the Mariana Islands, starting the Battle of Saipan, which ended on July 9. Of the 30,000 Japanese troops defending Saipan, fewer than 1,000 remained alive at the battle's end. Many Japanese civilians were also killed, by disease, starvation, enemy fire, and suicide. Approximately 1,000 civilians committed suicide by jumping off the cliffs at Mt. Marpi or Marpi Point. 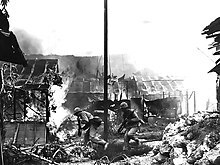 U.S. forces then recaptured Guam on July 21, and invaded Tinian on July 24. A year later Tinian was the takeoff point for the Enola Gay, the plane that dropped the atomic bomb on Hiroshima. Rota was left untouched (and isolated) until the Japanese surrender in August 1945, owing to its military insignificance. 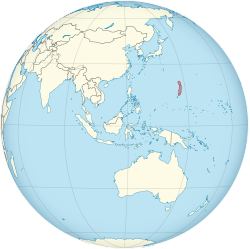 Under the Covenant, in general, United States federal law applies to CNMI. However, the CNMI is outside the customs territory of the United States and, although the internal revenue code does apply in the form of a local income tax, the income tax system is largely locally determined. According to the Covenant, the federal minimum wage and federal immigration laws "will not apply to the Northern Mariana Islands except in the manner and to the extent made applicable to them by the Congress by law after termination of the Trusteeship Agreement." The local control of minimum wage was superseded by the United States Congress in 2007. Basketball and mixed martial arts are also popular in the islands, which hosted the official 2009 Oceania Basketball Tournament. Trench Wars is the CNMI's Mixed Martial Arts brand. 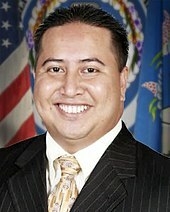 [ citation needed] Fighters from the CNMI have competed in the Pacific Xtreme Combat as well as the UFC. Other sports in the CNMI include Ultimate Frisbee , volleyball, tennis, soccer, outrigger sailing, softball, beach volleyball, rugby, golf, boxing, kickboxing, tae kwon do, track and field, Swimming, Triathlon, and American football. ^ Trefalt, Beatrice (November 2009). "After the Battle for Saipan: the Internment of Japanese Civilians at Camp Susupe, 1944–1946". Japanese Studies. 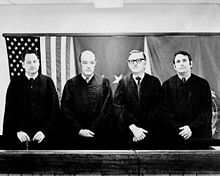 29 (3): 337–352. doi: 10.1080/10371390903298037 – via Taylor & Francis Online.